Probably my favorite band that is still at the top of their game (rules out Rolling Stones, Beatles, Pink Floyd, etc) is The Flaming Lips. They put out a new record this year called At War With The Mystics. I listened a bunch, liked it, but did not think it was at the level of The Soft Bulletin and Yoshimi. Until I saw them live twice in the span of one week, first with Gotham Gal and friends at ACL, and then with Jackson at Hammerstein. It was at the second show, with Jackson, that the brilliance of three songs in the middle of the record hit me; The Sound of Failure, My Cosmic Autumn Rebellion, and Vein of Stars. After those shows I put At War With The Mystics back into heavy rotation and its been there ever since. I love this record. My Cosmic Autumn Rebellion is a classic Flaming Lips song, up there with Do You Realize?, Waiting For A Superman, and Turn It On. 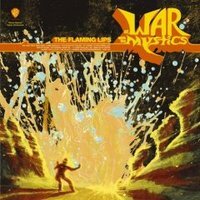 If you are a Lips fan and haven’t gotten into At War With The Mystics, give it another chance. It grows and grows on you.